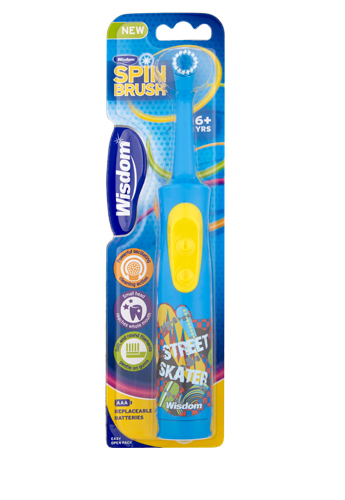 NEW Wisdom Spinbrush Kids has been specially designed to help establish good brushing habits for children 6 years and over. The powerful oscillating head contains soft filaments to provide gentle cleaning and effective plaque removal. Use twice a day for 2 minutes for a healthy smile! 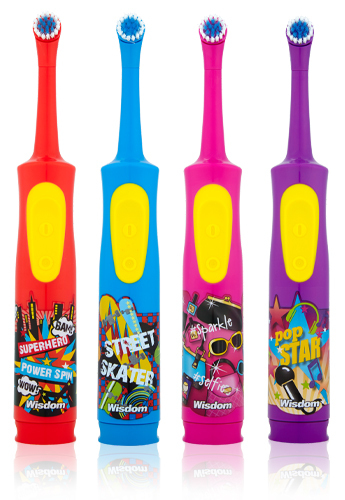 Available in a variety of designs to make brushing fun! To replace, unscrew the securing screw at the back of the brush to release base cap. Replace with 2 new AAA batteries in the position advised. Re-attach base cap, insert and tighten screw until secure. Not intended for use by children under 6. Children to be supervised whilst brushing. THIS IS NOT A TOY. This product is not to be used by persons (including children) with reduced physical, sensory or mental capabilities, or lack of experience and knowledge, unless they have been given supervision or instruction concerning the product by a person responsible for their safety.